We were waiting for the interviewer in Gen's application for scholarship when my eyes lingered on this somewhat comic version of librarian carrying big books. Even if the load is obviously heavy he seems happy with what he's doing. And who wouldn't happy with working with books everywhere. As I love books it would be a delightful thought! 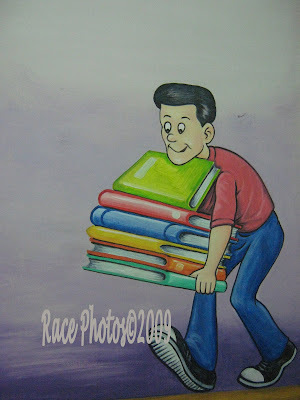 Happy WW, see my other entry of painting depicting education. Reminds me of my son who LOVES to check out books!